Like carrots, pumpkins are rich in beta-carotenes and vitamin A, important for your vision, prevent formation of cataracts and degeneration of the eye; it aids bone growth, can boost the immune system, and prevent premature aging as well as cardiovascular diseases. 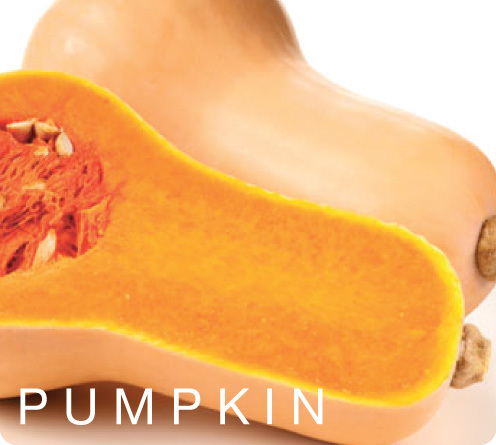 Pumpkins are also a good source of dietary fiber, anti-oxidants, minerals and B vitamins. Other health properties related to pumpkins are: anti-inflammatory effects; may reduce breast and prostate cancer risk in women and men (respectively); helps your skin by preventing the appearance of wrinkles; and as pumpkins contain an amino acid called tryptophan, which produces serotonin, it promotes feelings of well-being and happiness. Even the seeds are beneficial for your health; they contain proteins, fiber and minerals such as magnesium, and zinc; and are proven to reduce “bad” cholesterol.